Pike County PA Long-Term Water Quality Trend Analysis – Client: Pike County Conservation District. The Pike County PA Long-Term Water Quality Trend Analysis examined 10 years of water quality data for 56 stream stations (chemistry & macroinvertebrate) and prepared an analysis of temporal and spatial water quality trends. Cedar Eden Environmental, LLC also prepared GIS trend graphs, educational Powerpoint presentation, and web pages for the PCCD website to showcase the results of the study. Hamilton County NY Long-Term Water Quality Trend Analysis – Client: Hamilton County Soil & Water Conservation District. The Hamilton County NY Long-Term Water Quality Trend Analysis examined 10 years of water quality data for 21 lakes in Hamilton County, NY and conducted a long-term water quality trends analysis. Sophisticated trends analyses and statistical evaluations were performed on the data to develop relationships between various water quality and environmental parameters. Our trend analyses included an examination of both temporal and spatial trends for individual lakes, between lakes, and aggregated for the County. Lake Wallenpaupack PA Long-Term Water Quality Trend Analysis – Client: F. X. Browne, Inc. for Lake Wallenpaupack Watershed Management District. The Lake Wallenpaupack PA Long-Term Water Quality Trend Analysis examined 20 years of water quality data for five stations in Lake Wallenpaupack and conducted a long-term water quality trends analysis. Sophisticated trends analyses and statistical evaluations were performed on the data to develop relationships between various water quality and environmental parameters. Blue Mountain Lake is located in the hamlet of Blue Mountain Lake within the township of Indian Lake, Hamilton County, New York, at an approximate latitude and longitude of 43 51′ 09″ N, 74 28′ 16″ W. The surface area of Blue Mountain Lake is 1,334 acres. The elevation of Blue Mountain Lake is 1,662 feet (545.3 m) above mean sea level. Blue Mountain Lake has a maximum depth of approximately 100 feet (32.8 m), and a mean depth of approximately 46 feet (14.1 m). 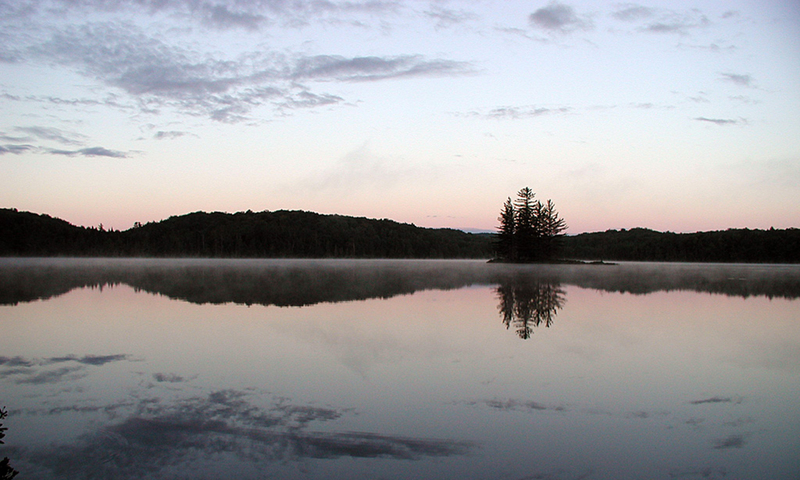 Blue Mountain Lake’s small watershed (7,130 acres) is the headwaters of the Raquette River. The outlet of Blue Mountain Lake flows unrestricted through Eagle Lake, over the dam at Utowana Lake, and to Raquette Lake as the Marion River. From there, the Raquette River flows through Forked Lake, Long Lake, Raquette Pond/Tupper Lake, the Carry Falls Reservoir and a number of smaller reservoirs. The Raquette River eventually enters the Saint Lawrence River at the Canadian border in upper Franklin County. Although the lake had excellent water quality, local concern over the potential damaging effects of development within the watershed and the lack of available scientific information on water quality led to the initiation of this project. The project had two main goals: 1) to establish the current water quality status of Blue Mountain Lake, and 2) to develop a computer model for use in managing growth within the watershed. A watershed geographic information system was developed to facilitate our modeling efforts. The figures below illustrate some aspects of the watershed GIS and modeling output (click on the images to “zoom in” and use back button to return to this page). The chapters on the modeling effort from the final report are available as a PDF document. You can also view the Full Report, which includes a summary of water quality, or just read the Executive Summary (PDF). *The first two dots show actual lake values, the second two dots show model-predicted current conditions, the fifth dot shows the effect of complete watershed development, and the last dot shows the effect of allowing watershed development up to a target in-lake chlorophyll a level of 2 micrograms per liter or less.